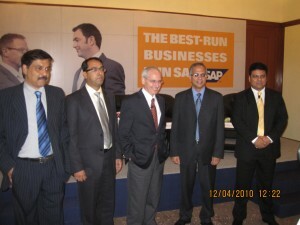 Anup Guha, CFO, Greaves Cotton shared his experience with ERP and rationale behind opting for SAP. Anup carries with him 30+ yrs experience in adapting technology for business. Q: Whats been your experience in using technology as enabler? Anup: Growth is understood differently by different people. For sales person it is top line, for a finance person it is EPS, for shareholders, return on his investment. What does an ERP do? We need growth to be seen by everyone in their own perspective, and ERP or a Business Intelligence helps achieving that. What does each product provide you? Can you improve on cost/discount/selling price and various other factors? ERP provides you the insight into your business.. Whatever way u look at it, one can make the most of it. It is a growth enabler. Q: While improving Operating efficiency, key measure is cost savings. Out side cost savings, how ERP can help in other areas? Anup: ERP gives you total diagnosis of your business. It breaks up your business into different facets-the way u want to see it, on top of all R3 that SAP is all about, it gives a BI layer. ERP is more of change management for 150 yrs + company, it is a mindset at end of the day. To be able to see the details it can provide, it requires lot of change in mind set. SAP was not our first ERP. We tried another ERP and then moved to SAP. We’d about 13 factories, 8 offices, 50 people spent 9-10 months trying to synergise the business from ERP perspective. We took lot of efforts to ensure that we do it right way. We’ve been aply supported by SAP in this. Manipal Universal is keen in using technology as an enabler for Transformation: We have about 220000 students today and we would be serving over 500000 students by 2013. Opportunities in developing markets is huge and technology will play a pivotal role in designing and implementing learning strategies that cover the complete value chain. 1st vector- front facing vector- use of technology results in better learning and teaching. 2nd is building framework of scaffolding- manage the whole quality of delivering high quality education system. Scale and sustainability has to go together. Hence the second part is equally important for us. We have 3 modes of deliveries- on campuses, distance education and more practice oriented vocational courses. Technology can play crucial role in all. There is a cultural diversity as we operate in multiple countries and geographies. We also have govt and community besides students and faculty.Context that exists in each of these are different. and this context has to be understood. 3rd is the scale and complexity of each of these. Quality is not fixed one, it has to move up contextually. Need keeps changing. Teaching computer science today is much different compared to what it was 5 yrs ago. When in the business of delivering outstanding academics, we need to look 4-5 years beyond… for that the foundation needs to be laid and technology alone can help. As an education service provider, we have an accountability to our key stake holders- the students. One role we play is the academic, second : that of a service provider. We need to ensure that every student who graduates is first an empowered and equipped learner and second, accountable learner. More about Manipal Universal can be found at www.manipalu.com/. Also be sure to watch this beautiful video of Manipal University… My all time favorite.